As I've mentioned (and even occasionally demonstrated) I like a good multi-race adventure. Especially when the races are very close together. Well, this week I've got two races that couldn't really be closer together without it becoming impossible to do both of them. A few weeks ago I mentioned that I'll be running the Jim Gibbons 5K this Thursday the 18th. That one starts at 6:25pm. Well late last week it came to my attention that there's a new 5K in town launching its inaugural run this Thursday evening... at 7pm. 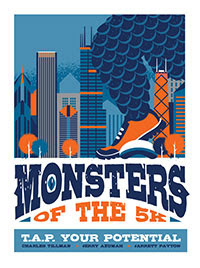 That race is the very sweetly named Monsters of the 5K/10K. This one starts at 7pm. Jim Gibbons is in Grant Park. Monsters is at Soldier Field. By my (extremely precise and careful) calculations that should give me exactly enough time to run Jim Gibbons, hop on a Divvy and make it to the Monsters starting line in time to experience both. We'll see. I've been known to miscalculate. Luckily, Monsters is chip-timed so if I miss the exact start I'll still be good to go. Either way, I'm now registered for both. And I'm excited about this second race not just because it has a very cool name (and a pretty awesome poster as well) but because it's a charity run benefiting the Charles Tillman Cornerstone Foundation, the Jarrett Payton Foundation and the Jerry Azumah's ASAP Foundation. Three cool guys, three cool foundations. One sweet inaugural race. And Universal Sole is coordinating. That's a group that knows how to put on a race and throw a party afterwards. And I'm going to need a party after these two 5Ks. If you cannot join us on race day, please consider donating or become a virtual runner to be eligible for all of the fantastic prizes we will be giving away! Registration is available on Active.com and signing up as a virtual runner is only $25. Anyone else planning on a doubleheader this Thursday? If not maybe I'll see you at one race or the other. Good luck, especially on getting from the first race to the one at Soldier Field in time! Turns out the 5K starts at 7:15 - so I've got plenty of time to spare now!